Where Does the Sand Come From? 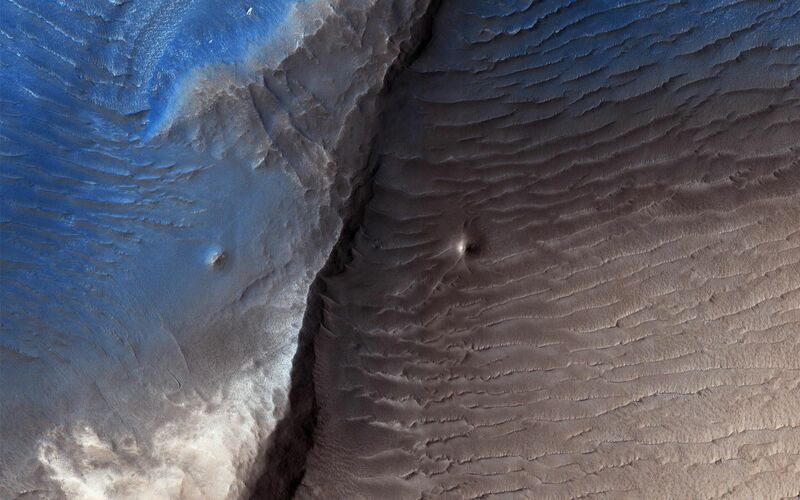 Geologists aren't quite sure what to make of the dark splotch in the middle of this image from NASA's Mars Reconnaisance Orbiter (MRO) -- one of several similar dark splotches that extend east and west for over 100 kilometers. From measurements made in infrared, this and other dark splotches have what we call "high thermal inertia," meaning that it heats up and cools down slowly. 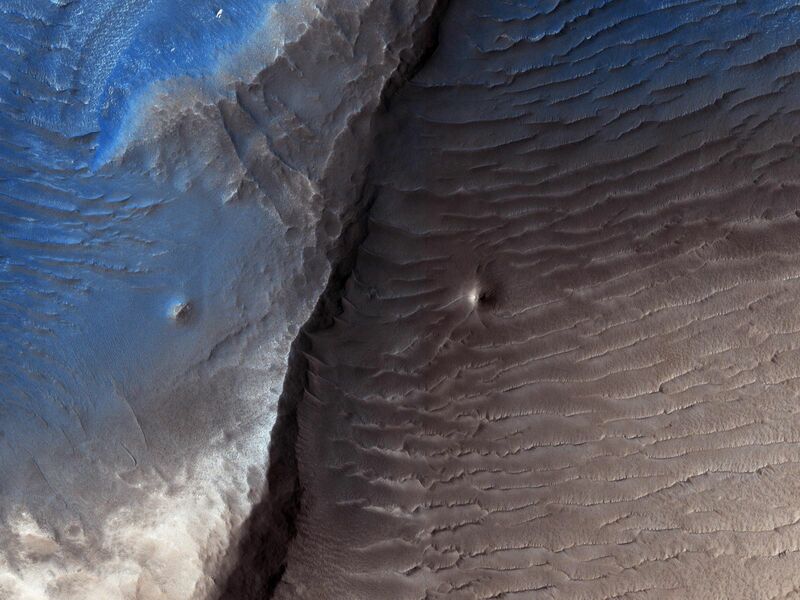 Scientists use thermal inertia to assess how rocky, sandy, or dusty a place is. A higher thermal inertia than the surrounding area means it's less dusty. Wavy, banded patterns in the dark splotch (possibly due to cross bedding from sand dunes that once occupied the area) were lithified into sandstone, and then eroded away. These clues could help geologists figure out what's going on there. This is a stereo pair with PSP_008935_1975. The map is projected here at a scale of 25 centimeters (9.8 inches) per pixel. [The original image scale is 28.1 centimeters (11 inches) per pixel (with 1 x 1 binning); objects on the order of 56.3 centimeters (22.2 inches) across are resolved.] North is up. 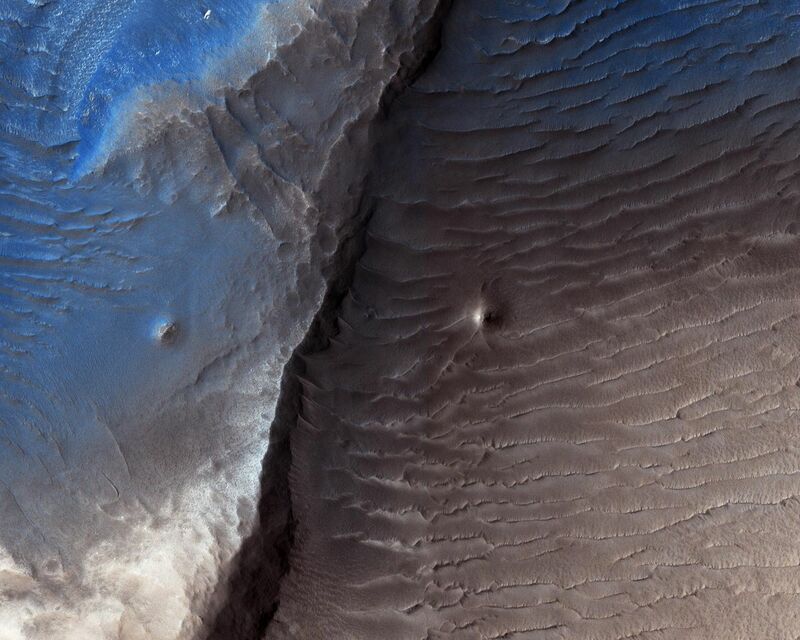 The University of Arizona, Tucson, operates HiRISE, which was built by Ball Aerospace & Technologies Corp., Boulder, Colo. NASA's Jet Propulsion Laboratory, a division of Caltech in Pasadena, California, manages the Mars Reconnaissance Orbiter Project for NASA's Science Mission Directorate, Washington.